Filled with medieval mosques and monuments, and mausoleums, Bijapur is a place where the past is very much a living part of the present. 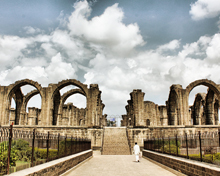 Referred to as the Palmyra of the Deccan in the medieval times, Bijapur is a famous travel destination of Karnataka. 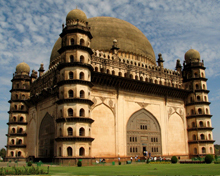 The piece de resistance of Bijapur’s relics is Gol Gumbaz. Its architecture has inspired generations of architects. The most famous monument in Bijapur, Gol Gumbaz is the tomb of Mohammed Adil Shah (1627 -56), the seventh ruler of Adil Shahi Dynasty. Built by the ruler himself in his lifetime, this gigantic mausoleum took 20 years to complete. Its huge dome, second in size only to the dome of St Peter's Basalica in Rome, is awe-inspiring. The Gol Gumbaz is famous for its remarkable engineering and perfect stereophonic acoustics. The Whispering Gallery of this historical building is another feature. 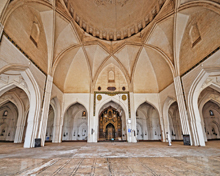 Gol Gumbaz complex contains a mosque, a Naqqar Khana (a hall for the trumpeters), a gateway and a dharmashala. South India’s psychological equivalent of the Taj Mahal at Bijapur, Ibrahim Rauza draws tourists to marvel at what is considered the most beautiful Muslim structure in the Deccan. Built during the reign of Sultan Ibrahim Adil Shah II (1580-1627) under his orders, the memorial complex is home to the tombs of Sultan and his wife, Taj Sultana. The tomb is famous for its gorgeous proportion, exquisite minarets, richly engraved walls, cupolas, parapets & cornices. One of the most imposing buildings in Bijapur, Gagan (sky) Mahal was built in the second half of the 16th century by Ali Adil Shah. The monument once served as a durbar hall. Gagan (sky) Mahal is the place where Sikandar Ali Shah, the last of the Adil Shahi rulers, was produced before the sixth Mughal emperor Aurangzeb when the latter conquered and incorporated the Adil Shahi kingdom in 1686. Built by Ali Adil Shah I in 1576, the historic Jama Masjid is one of the largest mosques in India. Featuring graceful arches, halls, aisles and massive crowning onion dome, the mosque can accommodate over 10,000 people at a time. Ali Adil Shah joined the Muslim Confederacy which defeated the Vijayanagar Empire in 1565 at the Battle of Talikota. Set in the Naqquar Khana of the Gol Gumbaz Complex, the Archaeological Museum an impressive archaeological museum which houses an impressive array of artefacts. 100 km from Bijapur, Aihole is considered to be cradle of the Hindu temple architecture. The place is a famous travel destination on its own right thanks to its vast assembly of cave temples. The place is home to about 125 temples divided into 22 groups. Durga temple is the most famous of the temples in Aihole. Ladh Khan Temple, Surya Narayan Temple, Gauda Temple, Kondi Group of Temples, Maguti Temple, Hucchimalli Temple and Ravanphadi Cave are other attractions in Aihole. 148 km from Bijapur, Pattadakal is an alluring destination for tourists for its awe inspiring chiseled temples built by the Chalukyas in the 7th and 8th centuries AD. Located on the banks of the Malaprabha River this World Heritage Site is home to several temples including Virupaksha Temple, Sangameshvara Temple, Chandrashekhara temple, Mallikarjuna Temple, Khadasiddheshwara Temple, Jambulinga Temple and Galaganatha Temple. Of these, Virupaksha Temple is the grandest of all. 132 km from Bijapur, Badami is famous for several temples constructed by the Chalukyas of Vatapi during the sixth-seventh century A.D. Some of these are magnificent rock-cut cave temples, while others are structural. During the Chalukyan times the temple architecture reached its zenith. The early Chalukyas had made their mark in history as prolific builders. Air	: Kolhapur (175 km) and Belgaum (203 km) are the nearest airports to Bijapur. Belgaum and Kolhapur is linked by Air Deccan flights with Mumbai. Rail : Bijapur is connected by rail with major cities and towns in south India. Road: Bijapur is connected by motorable road with major cities and towns in south India. Some of the cities and towns connected by road with Bijapur are Solapur (99 km), Aihole (110 km), Pattadakal (130 km), Badami (138 km), Gulbarga (159 km), Kolhapur (175 km), Belgaum (203 km), Hospet (241 km) Hampi (254 km), Bidar (273 km), Hyderabad (375 km), Mumbai (486 km) and Bangalore (570 km) KSRTC buses connect Bijapur with Badami, Bagalkot, Hubli, Bangalore, Belgaum and Solapur. Hotel Blue Diamond, Hotel Kanishka International, Hotel Kohinoor, Hotel Lalitha Mahal, Hotel Madhuvan International, Hotel Meghraj, Hotel Midland, Hotel Pearl, Hotel Rajdhani, Hotel Sagar Deluxe, Hotel Samrat, Hotel Sanman, Hotel Santosh, Shree Godavari Lakshmi Hotel, Hotel Tourist, Navratna International and Parekh Residency are the well-known hotels in Bijapur.